Environmental issues have been low in the North’s political agenda. They have, however, had political repercussions. First Minister Peter Robinson was perceived as close to developers in his East Belfast constituency. The main reason for his losing one of the safest seats in the UK Parliament after 31 years was the public perception that he and his wife, Iris, had been claiming excessive expenses; but a contributory factor was his support for building 300 houses on Knock Golf Club. Peter Carr from Dundonald Greenbelt Association said the grant of planning permission on this site was in breach of five major planning policies. “It was an extremely highly protected piece of land”, he says. “It was a ‘landscape wedge’ – higher than Greenbelt. It separates Dundonald from East Belfast. If that could be overturned, what was the value of any protection? Any green space in Northern Ireland was not safe”. Granting permission for such a large development in the North requires three senior planning officials to sign off on it. One of the three wrote that he was signing the planning permission under protest; this was unprecedented. Tillie and Henderson’s – mentioned in Das Kapital to assist McCambley. Clearly the developers believed it was useful to have influence with an MP and Assembly Member, whose husband was First Minister. The North’s planning system is, in many ways, even worse than in the Republic. It is biased in favour of developers. Objectors do not have the right of third-party appeal. The Planning Service, which is part of the Department of the Environment, is the North’s planning authority. However, if developers are refused permission they have an automatic right of appeal to the Planning Appeals Commission. In the Republic both developers and third-parties can appeal. Thus, there is a perception that the Planning Service feels it is administratively easier to grant permission. To date, no planner in the North has ever been charged with, let alone convicted of, corruption. 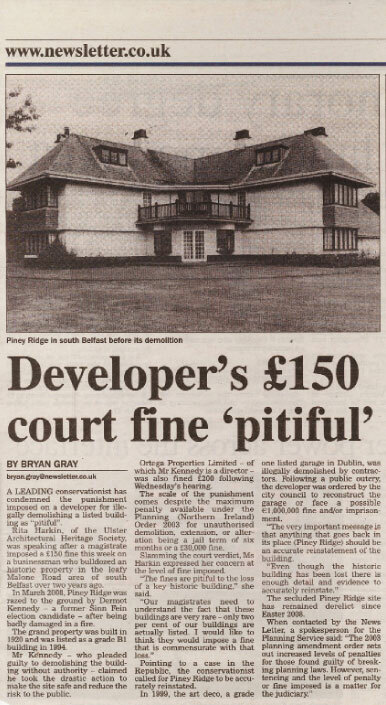 Rita Harkin of the Ulster Architectural Heritage Society said: “The Planning System has been so heavily weighted in favour of developers (with its established policy presumption in favour of development) that it might be argued that there was no need for corruption”. Politicians are active on planning issues; this is usually on the side of the developer. A briefing document from the NIPSA trade union said much time and resources in the Planning Service were taken up with “The political involvement in the process through lobbying by MPs, MLAs etc which is not a feature in planning authorities in Great Britain”, though it surely is in the Republic. The pro-development bias extends to politicians, across the spectrum. There have been 284 objections to a proposed quarry at Mullaslin, Co Tyrone. It has received one letter of support – from local MP Pat Doherty of Sinn Féin: “Given that the current economic climate and the fact that the applicant is a contractor employing numerous workers, I am requesting that you once again look at the application with a view to fast tracking it” – the characteristic dynamic mirrors that in the Republic precisely. One of the legacies of more than a generation of Direct Rule from Britain was that unelected officials gathered huge power. That has produced a culture of unaccountability at the top of the public sector. A new Draft Planning Bill, now going through the Assembly, will return planning powers to local councils. It is planned to cut the present 26 councils to 11. Despite all the difficulties seen with planning powers vested in local councils in the Republic, this will mean at least there will be some degree of accountability to communities affected by decisions. There will still be no right of third-party appeal against grants of planning permission. The Planning Service faces this challenge having lost 270 staff to downsizing. That represents about 40% of planners. Inevitably, it is facing workload problems. In a briefing document, the NIPSA trade union told the Assembly’s Environment Committee: “Importantly, despite the recent fall in applications, average annual caseloads continue to be well above that recommended for planning authorities in GB in the Addison Report, commissioned by the Office of the Deputy Prime Minister”. Budgetary constraints have meant it has had to cut back on enforcement. NIPSA’s document said: “The perversity of the proposed cuts is that, in the absence of sufficient commitment to funding enforcement activity, this revenue generating aspect will be compromised”. This may also leave the North open to infraction proceedings from the European Union. Currently, there are two major planning controversies in the North. They are a planned incinerator at Glenavy, Co Antrim, and the proposed A5 dual carriageway. In August, environment minister Edwin Poots of the DUP announced he was ‘minded’ to giver permission for the incinerator. Danny Moore of CALNI (Campaign Against the Lough Neagh Incinerator) said Poots was under pressure from agri-business interests in DUP. At the time of writing permission has not been given. The incinerator is proposed for a rural area outside Glenavy, on the east bank of Lough Neagh in south-west Antrim. It proposes to burn wastes from the North’s poultry industry, and will generate electricity. The developer is Rose Energy, owned by three agri-business companies. Lough Neagh supplies drinking water for 40% of the North’s population. Randox Laboratories, one of the biggest employers in the area, said it is considering moving some of its manufacturing to Donegal if the incinerator is built. CALNI has run a vigorous campaign. Objectors sent 6,782 letters of objection to Planning Service. CALNI has garnered unanimous support from Lisburn City Council, and all the North’s political parties. Moore and CALNI question the economic viability of the project. He said there were other means of disposing of the waste. “The poultry industry in the Republic reckons the total cost should be between five million and ten million”, says Moore. “That’s about one or two percent of the turnover of Moy Park (one of the shareholders in the proposed incinerator – A McC)”. CALNI commissioned a group of experts to draw up a report. Sir George Bain, former President of Queen’s University, chaired the group. It found the incinerator: Was the least efficient form of energy generation because it would operate at only 30% efficiency; Would generate toxic ash; Might not be sustainable, as the amount of local poultry litter available is not proven. The A5 is the biggest road project ever proposed for the North. The proposal is for a dual carriageway from the Tyrone-Monaghan border at Aughnacloy to Newbuildings, on the southern outskirts of Derry. The Republic’s government is putting up 50% of the funding. This is £400million (€477.6million), at present, or approximately 50% of the state’s budget for road construction – before Brian Lenihan’s draconian budget. It has already paid £8.5million (€10.15million) for preparatory work, before a single sod has been turned. Traffic from the northern half of Co Donegal will also use the road to travel to Dublin. Three roads built in the last decade are to be by-passed. These are the Newtownstewart bypass, finished in 2002 at a cost of £8.2million (€9.8million); Stage 2 of the Strabane bypass, finished in 2003 at a cost of £4.2million (€5million); and Phase 3 of the Omagh throughpass, finished in 2006 at a cost of £9.7million (€11.6million). The road will occupy 4,000 acres of farmland. As well as taking farmland, the road will also split farms. This has led to an alliance between environmental campaigners and farmers – perhaps because of the greater prices paid to farmers in compensation in the Republic such alliances have been rare there. They have established the Alternative A5 Alliance. One of the proposals from some in the Alliance is to have a three-lane road with a railway running beside it. A provisional costing puts this at no more expensive than the proposed road. “The railway will be an alternative transport mode that will tend to constrain the growth of traffic on the A5, a strategy that the Department for Regional Development should have been proposing, not a protest group”, says Malcolm Lake, a member of the Alliance. The controversy regarding the road is part of a wider Northern problem. Eighty per cent of spending on transport goes on roads. There are indications of a reduction rather than an increase in public transport. Six of the 11 daily bus services from Dublin to Derry are being removed after Christmas; this service is operated by Bus Éireann and Ulsterbus (part of Translink, the North’s publicly-owned transport company). Suburban rail in Belfast has suffered permanent under-investment. There are worries about the future of the North’s main internal railway line, from Belfast to Derry. The obsession with roads is inhibiting the North’s ability to restrict greenhouse-gas emissions. While there is a commitment to reduce emissions, there is no climate-change legislation. Despite this, the North has made some progress. Overall, greenhouse gas emissions fell 11.1% between 1990 and 2008. During the same period, transport emissions increased by 35.9%. They now represent 24.9% of all emissions, the second-highest category. There is also a concentration on airports. The North has three: the long-established Belfast International to the west of the city, Belfast City on the seafront in East Belfast, and City of Derry. Michael O’Leary has caused planning mayhem at the former two. Derry City Council pushed through an expansion of the airport runway, in the teeth of the opposition of local residents. O’Leary failed to get the same from Belfast City. Nevertheless, Northern Environment Minister Edwin Poots has already removed a cap on the number of flights from the airport. A survey by campaigners found noise from the airport interferes with the sleep of 78% of residents in the area. The North has already lost significant parts of its built heritage. The North St Arcade in Belfast was a 1930s shopping arcade. It was destroyed in a malicious fire six years ago. One of the businesses lost was Terry Hooley’s record shop ‘Good Vibrations’. This played a very important part in the history of popular music in these islands, and beyond. ‘Good Vibrations’ was a focal point for musicians, and in particular punk musicians. The Royal Exchange retail development is planned to swallow this site. Only the arcade’s façade will be reinstated. The Ulster Architectural Heritage Society is seeking to have the arcade reinstated – a possibility, as the original architectural drawings still exist. Tillie & Henderson’s factory in Derry was a major set-piece of 19th Century industrial architecture. When built in the 1850s it was the largest shirt factory in the world. It is mentioned in Volume 1 of Karl Marx’s ‘Das Kapital’. 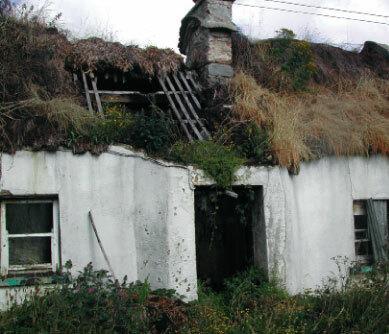 Having been allowed to fall into dereliction, an unknown arsonist set it on fire. The developer who owned the building then demolished it. He is seeking permission to build a hotel on the site. 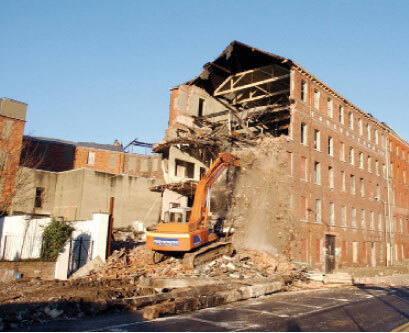 The Ulster Architectural Heritage Society is currently seeking to stop the demolition of a row of vernacular buildings at Canal St, Newry. The buildings date from the city’s years as a major port, and are an important part of its industrial heritage. The rural community in the Glens of Antrim has come under pressure because of holiday home development in the area. Former councillor Monica Digney said that lack of affordable housing is forcing young people to move out. “It is leaving the Glens with an ageing community, and people that come for a few weeks of the year for holiday homes”, she says. Both mining and quarrying activity are controversial. Residents round Ireland’s only gold mine, near Omagh, have been fighting an on-going battle for some years. The Planning Service is currently investigating breaches of planning permission. Despite devolution, the North’s political system is not yet environmentally sensitive. Though there was a strong campaign from Friends of the Earth and other organisations, there is no independent Environmental Protection Agency. The cuts in Planning Service mean that half the staff working on development plans have been redeployed. The planning system remain pro-development. Planning Policy Statement 14 was perceived as restricting development in the countryside. The very first act of the new Assembly was to relax this constraint. Last summer, it was replaced with a less restrictive Policy Statement, Planning Policy Statement 21 ‘Sustainable Development in the Countryside’. Though a large multiple of rates in Britain, one-off housing remains in the North is built at rates that are still a fraction of those in the Republic where, in Monaghan for example) they are over 70%. Much separates the political cultures of the Republic from its northern neighbour. In planning and environmental protection, however, short-termism and a libertarian faith in the rights of property drive a culture and a politics, and threaten to leave a legacy, that are eerily indistinguishable.